With over 20 years experience as an event balloon decorator with great reputation and reasonable pricing, Visual Fantasies Balloons has grown to become one of the most exclusive balloon artistry businesses in the Metro-Detroit area. 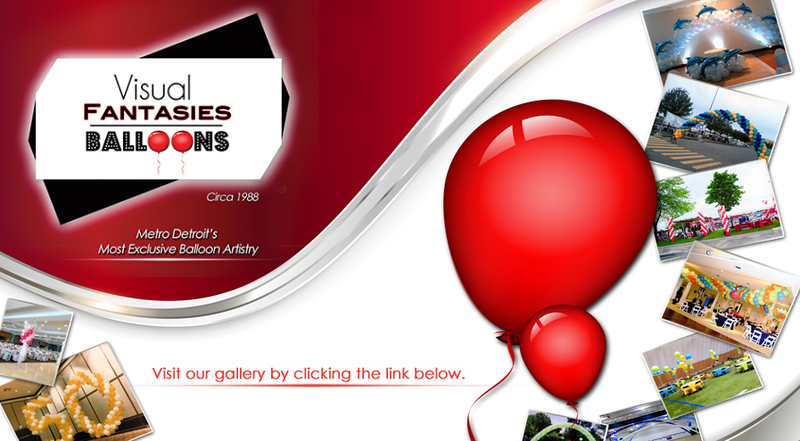 We are dedicated to providing professionalism, breathtaking balloon creations and customer satisfaction for any event. We offer the very best in balloon artistry & décor. Click any of the links below to be directed to our gallery. Contact Us Today! 313.737.5607 with any questions or to place an order. We make balloon sculptures in Michigan for all occasions: Bat Mitzvahs, wedding receptions, bridal & baby showers, anniversaries, birthday celebrations, social events, proms, graduations, corporate & political events. We also offer free, no-obligation consultations, where you may review our portfolio of artistic balloon sculpture creations. So let Visual Fantasies Balloon Decorating Company make your next event a spectacular one!